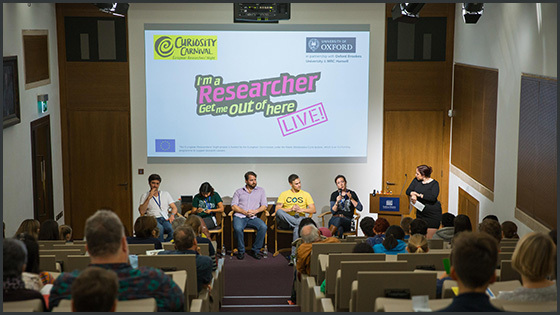 As part of the Curiosity Carnival, Dr Michaela Livingstone-Banks, Public Engagement Facilitator at MPLS, and her team organised the event 'I'm a researcher, get me out of here'. It sought to inspire and inform students about the work done by researchers at Oxford. In advance, a number of researchers from various fields set up an online profile, based on which students could ask them any questions. Using the online platform ASK, students sent the researchers questions on their research work, how they got into it, little questions, big questions, hobbies - the list goes on! At the final stage, students voted for their favourite researchers to go through to the live event, where they crowned their winner: Dr Priyanka Dhopade, Engineering Science. This event enabled young people to engage with researchers in a meaningful way. It sought to dispel the stereotype that research isn't 'for people like me' and was extremely successful. The participating students were asked whether they found jobs involving research interesting: before the event only 41% said so, after the event the number rose to a stunning 79%. On top of that, all researchers involved said they enjoyed it and would participate again. My students saw the exciting breadth of research that is being conducted [at Oxford] and this event will inspire them to do well academically.